South Korean internet giant Naver said Thursday that its operating profit in the first quarter of this year rose 13.2 percent on-year to 290.8 billion won ($257 million), led by strong advertisement sales and heightened transactions on its mobile and online platform services. Naver’s revenue also went up 15.5 percent on-year to 1.82 trillion won in the January-March period. Its net profits rose 27.8 percent on-year to 210.9 million won during the given period. Naver’s first-quarter ad sales -- including online and mobile display ads as well as ads featured on Naver TV --went up 22.3 percent on-year to reach 99.7 billion won. During the first quarter, its business platform service sales, including cost-per-click and cost-per-sale ads, rose 13.3 percent on-year to 509.7 billion won, led by heightened mobile search and shopping queries. Naver’s first-quarter IT platform sales also soared 91.9 percent on-year to 43.4 billion won, driven by a hike in the number of transactions made via the firm’s simplified mobile payment service Naver Pay. Its content sales in the quarter fell 23.7 percent on-year to 23.5 billion won, due to costs related to the merging of its mobile app store One Store. Naver’s Line mobile messenger -- operated by its Japan-based subsidiary Line Corp. -- and other platform services including video messaging app Snow contributed 406 billion won in sales, up 15.2 percent on-year, the company said. Looking ahead, Naver CEO Han Seong-sook reaffirmed in a conference call the firm’s pledge to transform itself into a “technology platform,” saying the company will invest 100 billion won toward its artificial intelligence and new technology development efforts this year. 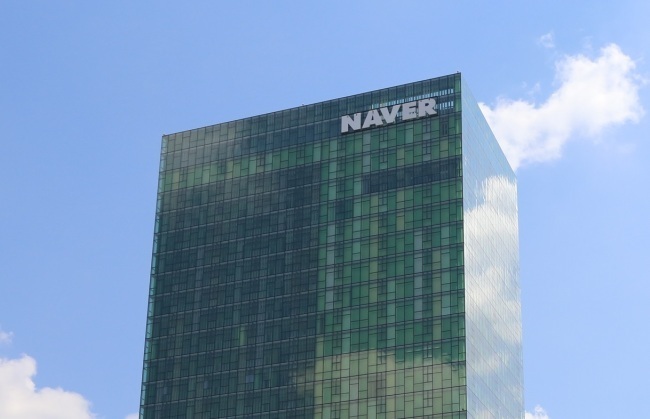 The move comes as part of Naver’s stated agenda to invest more than 500 billion won toward new technology and content over the next five years. Naver and Line are planning to introduce a new artificially intelligent voice assistant platform -- the Cloud Virtual Assistant, or Clova -- by June this year. Clova, which runs on the cloud, combines speech recognition and natural language processing abilities to respond to a user’s questions.